Modern intraocular lenses are made of polymer materials that have proven to be very well tolerated in the eye over decades of use. They are flexible so they can be rolled to fit through a very small incision. Once inside the eye, they unfold to about a quarter of an inch in size. Side struts, called haptics, hold them in place inside the eye. 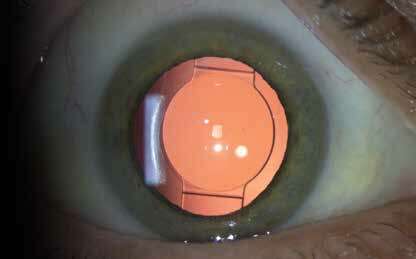 The lens implants become part of the eye. They are safe, stable, and reliable, and they require no care or maintenance other than general practices for good eye health (Figure 23). Figure 23. 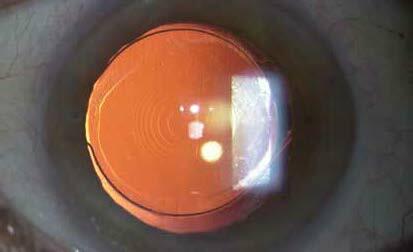 Photo of another type of intraocular lens implant (IOL) in the eye. In refractive lens exchange (RLE), the natural lens is removed from the eye through a tiny incision and replaced with an IOL. The power of the IOL is chosen to correct nearsightedness, farsightedness, and astigmatism. A single-focus IOL, also called a standard IOL, has a single fixed focal point. These lenses provide precise vision at a particular distance. With refractive lens exchange, the lens implant in one eye is usually set for excellent distance vision. The other eye may also be set for excellent distance vision, or it may be set for reading or intermediate vision, an arrangement called monovision. Toric IOLs are single-focus IOLs that also have a builtin ability to correct astigmatism. Astigmatism means that your cornea is oval shaped like a football instead of round like a basketball. If you have significant astigmatism and it isn’t corrected, your vision won’t be perfectly clear at any distance. Toric IOLs are an excellent way to correct astigmatism and provide very crisp vision at the chosen distance. Monovision can also be done with toric IOLs to provide both excellent reading and distance vision. If you have a significant astigmatism, a toric lens is the best IOL option for you. Most IOLs, once implanted, don’t move within your eye. Accommodating IOLs are IOLs that can adjust their focus somewhat to provide a greater range of vision than a standard or toric IOL. These IOLs are soft and flexible, like the eye’s natural lens prior to the need for reading glasses. The muscle in the eye that flexes the natural lens also flexes the accommodating IOL, changing its focusing power. This allows the accommodating IOL to offer both good distance and good mid-range vision without glasses. Monovision can be done with these lenses as well, to provide good reading vision without glasses. The main disadvantage of accommodating IOLs is that the extra range of vision is limited, so most patients still need reading glasses. Also, these lenses are not as effective in younger individuals with large pupils because the lenses can allow more night glare. Multifocal, or bifocal IOLs, have different focusing zones built into the lens, allowing a wide range of vision with decreased dependence on glasses (Figure 24). People who choose multifocal lenses can usually do almost anything they want without glasses. Unlike standard spectacle bifocal lenses, you don’t have to look up to see far away and look down to read. You can see close and far in any direction you look. These IOLs work by dividing the light that enters the eye, focusing half the light for distance vision and the other half for close vision. Because of the way they focus light, these lenses have two disadvantages. They produce small halos around headlights and streetlights at night. These halos normally are not bothersome and do not interfere with night driving. The other disadvantage is that distance vision is not quite as sharp as it is with glasses or contacts because part of the incoming light is being used for reading. Your doctor will discuss with you whether a multifocal IOL would be appropriate for you. Figure 24. A multifocal IOL has a series of concentric rings etched on the lens that provide both a far and close focus. This allows good distance and reading vision without glasses. The variety of IOLs available makes refractive lens exchange a very flexible and customizable approach to optimizing your vision without glasses.